The school considers itself the fourth-oldest institution of higher education in the United States, as well as the first university in the United States with both undergraduate and graduate studies. In 1740, a group of Philadelphians joined together to erect a great preaching hall for the traveling evangelist George Whitefield, who toured the American colonies delivering open air sermons. The building was designed and built by Edmund Woolley and was the largest building in the city at the time. It was initially planned to serve as a charity school as well; however, a lack of funds forced plans for the chapel and school to be suspended. In the fall of 1749, eager to create a school to educate future generations, Benjamin Franklin circulated a pamphlet titled “Proposals for the Education of Youth in Pennsylvania,” his vision for what he called a “Public Academy of Philadelphia.” However, according to Franklin’s autobiography, it was in 1743 when he first had the idea to establish an academy, “thinking the Rev. 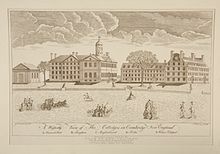 Richard Peters a fit person to superintend such an institution.” Unlike the other Colonial colleges that existed in 1743—Harvard, William and Mary, and Yale—Franklin’s new school would not focus merely on education for the clergy. He advocated an innovative concept of higher education, one which would teach both the ornamental knowledge of the arts and the practical skills necessary for making a living and doing public service. The proposed program of study could have become the nation’s first modern liberal arts curriculum, although it was never implemented because William Smith, an Anglican priest who was provost at the time, and other trustees preferred the traditional curriculum. Franklin assembled a board of trustees from among the leading citizens of Philadelphia, the first such non-sectarian board in America. At the first meeting of the 24 members of the Board of Trustees (November 13, 1749) the issue of where to locate the school was a prime concern. Although a lot across Sixth Street from Independence Hall was offered without cost by James Logan, its owner, the Trustees realized that the building erected in 1740, which was still vacant, would be an even better site. The original sponsors of the dormant building still owed considerable construction debts and asked Franklin’s group to assume their debts and, accordingly, their inactive trusts. On February 1, 1750 the new board took over the building and trusts of the old board. On August 13, 1751 the Academy of Philadelphia, using the great hall at 4th and Arch Streets, took in its first secondary students. A charity school also was opened in accordance with the intentions of the original “New Building” donors, although it lasted only a few years. In 1755, the College of Philadelphia was chartered, paving the way for the addition of undergraduate instruction. All three schools shared the same Board of Trustees and were considered to be part of the same institution. The institution of higher learning was known as the College of Philadelphia from 1755 to 1779. In 1779, not trusting then-provost the Rev. William Smith’s loyalist tendencies, the revolutionary State Legislature created a University of the State of Pennsylvania. The result was a schism, with Smith continuing to operate an attenuated version of the College of Philadelphia. In 1791 the legislature issued a new charter, merging the two institutions into the University of Pennsylvania with twelve men from each institution on the new board of trustees. Penn has three claims to being the first university in the United States, according to university archives director Mark Frazier Lloyd: the 1765 founding of the first medical school in America made Penn the first institution to offer both “undergraduate” and professional education; the 1779 charter made it the first American institution of higher learning to take the name of “University”; and existing colleges were established as seminaries. After being located in downtown Philadelphia for more than a century, the campus was moved across the Schuylkill River to property purchased from the Blockley Almshouse in West Philadelphia in 1872, where it has since remained in an area now known as University City. Although Penn began operating as an academy or secondary school in 1751 and obtained its collegiate charter in 1755, it initially designated 1750 as its founding date; this is the year which appears on the first iteration of the university seal. 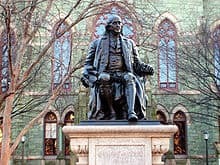 Sometime later in its early history, Penn began to consider 1749 as its founding date; this year was referenced for over a century, including at the centennial celebration in 1849. In 1899, the board of trustees voted to adjust the founding date earlier again, this time to 1740, the date of “the creation of the earliest of the many educational trusts the University has taken upon itself.” The board of trustees voted in response to a three-year campaign by Penn’s General Alumni Society to retroactively revise the university’s founding date to appear older than Princeton University, which had been chartered in 1746.